‘The rabbits came many grandparents ago. In this sobering allegory of colonization, Napoleonic white rabbits subjugate a population of gentle brown marsupials. The lemur-like narrators live humbly in an arid region ("At first we didn't know what to think. They looked a bit like us"). 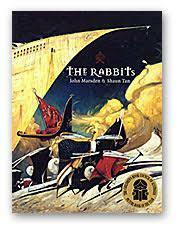 They describe how the Rabbits, who wear military garb and have perfect straight-backed posture, arrive by sea in a metallic golden ship that bristles with sails and steaming iron pipes. The Rabbits carry black muskets and calibrated measuring devices. As the unclothed, rust-brown animals look on impotently, the red-eyed Rabbits brutally alter the landscape. Monstrous sheep graze on artificially green paddocks, and hills are cut away to accommodate highways. By the time the indigenous creatures rebel, in sepia battle scenes, "there were too many rabbits. We lost the fights." In the bleak conclusion, the speakers lament what has been lost: "Where is the rich dark earth brown and moist?... Where are the lakes, alive with long-legged birds?" A sequel and companion volume to Ted Hughes' The Iron Man. 1 The Coming of the Iron Man The Iron Man came to the top of the cliff. How far had he walked? Nobody knows. Where did he come from? Nobody knows. How was he made? Nobody knows. Taller than a house, the Iron Man stood at the top of the cliff, on the very brink, in the darkness. The wind sang through his iron fingers. His great iron head, shaped like a dustbin but as big as a bedroom, slowly turned to the right, slowly turned to the left. His iron ears turned, this way, that way. He was hearing the sea. His eyes, like headlamps, glowed white, then red, then infrared, searching the sea. Never before had the Iron Man seen the sea. He swayed in the strong wind that pressed against his back. He swayed forward, on the brink of the high cliff. And his right foot, his enormous iron right foot, lifted - up, out into space, and the Iron Man stepped forward, off the cliff, into nothingness. CRRRAAAASSSSSSH! Down the cliff the Iron Man came toppling, head over heels. CRASH! CRASH! CRASH! From rock to rock, snag to snag, tumbling slowly. And as he crashed and crashed and crashed. His iron legs fell off. His iron arms broke off, and the hands broke off the arms. His great iron ears fell off and his eyes fell out. His great iron head fell off. All the separate pieces tumbled, scattered, crashing, bumping, clanging, down on to the rocky beach far below. A few rocks tumbled with him. Then Silence. Only the sound of the sea, chewing away at the edge of the rocky beach, where the bits and pieces of the Iron Man lay scattered far and wide, silent and unmoving. Only one of the iron hands, lying beside an old, sand-logged washed-up seaman’s boot, waved its fingers for a minute, like a crab on its back. Then it lay still. While the stars went on wheeling through the sky and the wind went on tugging at the grass on the cliff top and the sea went on boiling and booming. Nobody knew the Iron Man had fallen. Night passed. Just before dawn, as the darkness grew blue and the shapes of the rocks separated from each other, two seagulls flew crying over the rocks. They landed on a patch of sand. They had two chicks in a nest on the cliff. Now they were searching for food. One of the seagulls flew up - Aaaaaark! He had seen something. He glided low over the sharp rocks. He landed and picked something up. Something shiny, round and hard. It was one of the Iron Man’s eyes. He brought it back to his mate. They both looked at this strange thing. And the eye looked at them. It rolled from side to side looking first at one gull, then at the other. The gulls, peering at it, thought it was a strange kind of clam, peeping at them from its shell. Then the other gull flew up, wheeled around and landed and picked something up. Some awkward, heavy thing. The gull flew low and slowly, dragging the heavy thing. Finally, the gull dropped it beside the eye. This new thing had five legs. It moved. The gull thought it was a strange kind of crab. They thought they had found a strange crab and a strange clam. They did not know they had found the Iron Man’s eye and the Iron Man’s right hand. But as soon as the eye and the hand got together, the eye looked at the hand. Its light glowed blue. The hand stood up on three fingers and its thumb, and craned its forefinger like a long nose. It felt around. It touched the eye. Gleefully it picked up the eye, and tucked it under its middle finger. The eye peered out, between the forefinger and thumb. Now the hand could see. It looked around. Then it darted and jabbed one of the gulls with its stiffly held finger, then darted at the other and jabbed him. The two gulls flew up into the wind with a frightened cry. Slowly then the hand crept over the stones, searching. It ran forward suddenly, grabbed something and tugged. But the thing was stuck between two rocks. The thing was one of the Iron Man’s arms. At last the hand left the arm and went scuttling hither and thither among the rocks, till it stopped, and touched something gently. This thing was the other hand. This new hand stood up and hooked its finger round the little finger of the hand with the eye, and let itself be led. Now the two hands, the seeing one leading the blind one, walking on their fingertips, went back together to the arm, and together they tugged it free. The hand with the eye fastened itself on to the wrist of the arm. The arm stood up and walked on its hand. The other hand clung on behind as before, and this strange trio went on searching. An eye! There it was, blinking at them speechlessly beside a black and white pebble. The seeing hand fitted the eye to the blind hand and now both hands could see. They went running among the rocks. Soon they found a leg. They jumped on top of the leg and the leg went hopping over the rocks with the arm swinging from the hand that clung to the top of the leg. The other hand clung on top of that hand. The two hands, with their eyes, guided their leg, twisting it this way and that, as a rider guides a horse. Soon they found another leg and another arm. Now each hand, with an eye under its palm and an arm dangling from its wrist, rode on a leg separately about the beach. Hop, hop, hop , hop they went, peering among the rocks. One found an ear and at the same moment the other found the giant torso. Then the busy hands fitted the legs to the torso, then they fitted the arms, each fitting the other, and the torso stood up with legs and arms but no head. It walked about the beach, holding its eyes up in its hands, searching for its lost head. At last, there was the head - eyeless, earless, nested in a heap of read seaweed. Now in no time the Iron Man had fitted his head back, and his eyes were in place, and everything in place except for one ear. He strode about the beach searching for his lost ear, as the sun rose over the sea and the day came. The two gulls sat on their ledge, high on the cliff. They watched the immense man striding to and fro over the rocks below. Between them, on the nesting ledge, lay a great iron ear. The gulls could not eat it. The baby gulls could not eat it. There it lay on the high ledge. Far below, the Iron Man searched. At last he stopped, and looked at the sea. Was he thinking the sea had stolen his ear? Perhaps he was thinking the sea had come up, while he lay scattered, and had gone down again with his ear. He walked towards the sea. He walked into the breakers, and there he stood for a while, the breakers bursting around his knees. Then he walked in deeper, deeper, deeper. The gulls took off and glided down low over the great iron head that was now moving slowly out through the swell. The eyes blazed red, level with the wavetops, till a big wave covered them and foam spouted over the top of the head. The head still moved out under water. The eyes and the top of the head appeared for a moment in a hollow of the swell. Now the eyes were green. Then the sea covered them and the head. The gulls circled low over the line of bubbles that went on moving slowly out of the deep sea. 2 The Return of the Iron Man One evening a farmer’s son, a boy called Hogarth, was fishing in a stream that ran down to the sea. It was growing too dark to fish, his hook kept getting caught in weeds and bushes. So he stopped fishing and came up from the stream and stood listening to the owls in the wood further up the valley, and to the sea behind him. Hush, said the seam. And again, Hush. Hush. Hush. Suddenly he felt a strange feeling. He felt he was being watched. He felt afraid. He turned and looked up the steep field to the top of the high cliff. Behind that skyline was the sheer rocky cliff and the sea. And on that skyline, just above the edge of it, in the dusk, were two green lights. What were two green lights doing at the top of the cliff? Then, as Hogarth watched, a huge dark figure climbed up over the cliff-top. The two lights rose into the sky. They were the giant figure’s eyes. A giant black figure, taller than a house, black and towering in the twilight, with green headlamp eyes. The Iron Man! There he stood on the cliff-top, looking inland. Hogarth began to run. He ran and ran. Home. Home. The Iron Man had come back. So he got home at last and gasping for breath he told his dad. An Iron Man! An Iron Man! A giant! His father frowned. His mother grew pale. His little sister began to cry. His father took down his double-barrelled gun. He believed his son. He went out. He locked the door. He got in his car. He drove to the next farm. But the farmer laughed. He was a fat, red man, with a fat, red-mouthed laugh. When he stopped laughing, his eyes were red too. An Iron Man? Nonsense, he said. So Hogarth’s father got back in his car. Now it was dark and it began to rain. He drove to the next farm. That farmer frowned. He believed. Tomorrow, he said, we must see what he is, this iron man. His feet will have left tracks in the earth. So Hogarth’s father again got back into his car. But as he turned the car in the yard, he saw a strange thing in the headlamps. Half a tractor lay there, just half, chopped clean off, the other half missing. He got out of his car and the other farmer came to look too. The tractor had been bitten off – there were big teeth-marks in the steel. No explanation! The two men looked at each other. They were puzzled and afraid. What could have bitten the tractor in two? There, in the yard, in the rain, in the night, while they had been talking inside the house. The farmer ran in and bolted the door. Hogarth’s father jumped into his car and drove off into the night and the rain as fast as he could, homeward. The rain poured down. Hogarth’s father drove hard. The headlights lit up the road and bushes. Suddenly – two headlamps in a tall treetop at the roadside ahead. Headlamps in a treetop? How? Hogarth’s father slowed, peering up to see what the lights might be, up there in the treetop. As he slowed, a giant iron foot came down in the middle of the road, a foot as big as a single bed. And the headlamps came down closer. And a giant hand reached down towards the windshield. The Iron Man! Hogarth’s father put on speed, he aimed his car at the foot. Crash! He knocked the foot out of the way. He drove on, faster and faster. And behind him, on the road, a clanging clattering boom went up, as if an iron skyscraper had collapsed. The iron giant, with his foot knocked from under him, had toppled over. And so Hogarth’s father got home safely. BUT Next morning all the farmers were shouting with anger. Where were their tractors? Their earth-diggers? Their ploughs? Their harrows? From every farm in the region, all the steel and iron farm machinery had gone. Where to? Who had stolen it all? There was a clue. Here and there lay half a wheel, or half an axle, or half a mudguard, carved with giant toothmarks where it had been bitten off. How had it been bitten off? Steel bitten off? What had happened? There was another clue. From farm to farm, over the soft soil of the fields, went giant footprints, each one the size of a single bed. The farmers, in a frightened, silent, amazed crowd, followed the footprints. And at every farm the footprints visited, all the metal machinery had disappeared. Finally, the footprints led back up to the top of the cliff, where the little boy had seen the Iron Man appear the night before, when he was fishing. The footprints led right to the cliff-top. And all the way down the cliff were torn marks on the rocks, where a huge iron body had slid down. Below, the tide was in. The grey, empty, moving tide. The Iron Man had gone back into the sea. SO The furious farmers began to shout. The Iron Man had stolen all their machinery. Had he eaten it? Anyway, he had taken it. It had gone. So what if he came again? What would he take next time? Cows? Houses? People? They would have to do something. They couldn’t call in the police or the Army, because nobody would believe them about this Iron Monster. They would do something for themselves. So, what did they do? At the bottom of the hill, below where the Iron Man had come over the high cliff, they dug a deep, enormous hole. A hole wider than a house, and as deep as three trees one on top of the other. It was a colossal hole. A stupendous hole! And the sides of it were sheer as walls. They pushed all the earth off to one side. They covered the hole with branches and the branches they covered with straw and the straw with soil, so when they finished the hole looked like a freshly-ploughed field. Now, on the side of the hole opposite the slope up to the top of the cliff, they put an old rusty lorry. That was the bait. Now they reckoned the Iron Man would come over the top of the cliff out of the sea, and he’d see the old lorry which was painted red, and he’d come down to get it to chew it up and eat it. But on his way to the lorry he’d be crossing the hole, and the moment he stepped with his great weight on to that soil held up only with straw and branches, he would crash through into the hole and would never get out. They’d find him there in the hole. Then they’d bring the few bull-dozers and earth-movers that he hadn’t already eaten, and they’d push the pile of earth in on top of him, and bury him for ever in the hole. They were certain now that they’d get him. Next morning, in great excitement, all the farmers gathered together to go along to examine their trap. They came carefully closer, expecting to see his hands tearing at the edge of the pit. They came carefully closer. The red lorry stood just as they had left it. The soil lay just as they had left it, undisturbed. Everything was just as they had left it. The Iron Man had not come. Nor did he come that day. Next morning, all the farmers came again. Still, everything lay just as they had left it. And so it went on, day after day. Still the Iron Man never came. Now the farmers began to wonder if he would ever come again. They began to wonder if he had ever come at all. They began to make up explanations of what had happened to their machinery. Nobody likes to believe in an Iron Monster that eats tractors and cars. Soon, the farmer who owned the red lorry they were using as bait decided that he needed it, and he took it away. So there lay the beautiful deep trap, without any bait. Grass began to grow on the loose soil. The farmers talked of filling the hole in. After all, you can’t leave a giant pit like that, somebody might fall in. Some stranger coming along might just walk over it and fall in. But they didn’t want to fill it in. It had been such hard work digging it. Besides they all had a sneaking fear that the Iron Man might come again, and that the hole was their only weapon against him. At last they put up a little notice: “DANGER: KEEP OFF”, to warn people away, and they left it at that. Now the little boy Hogarth had an idea. He thought he could use that hole, to trap a fox. He found a dead hen one day, and threw it out on to the loose soil over the trap. Then towards evening, he climbed a tree nearby, and waited. A long time he waited. A star came out. He could hear the sea. Then – there, standing at the edge of the hole, was a fox. A big, red fox, looking towards the dead hen. Hogarth stopped breathing. And the fox stood without moving – sniff, sniff, sniff, out towards the hen. But he did not step out on to the trap. Was he too smart to walk out there where it was not safe? But at that moment he stopped sniffing. He turned his head and looked towards the top of the cliff. Hogarth, wondering what the fox had seen, looked towards the top of the cliff. There, enormous in the blue evening sky, stood the Iron Man, on the brink of the cliff, gazing inland. In a moment, the fox had vanished. Now what? Hogarth carefully quietly hardly breathing climbed slowly down the tree. He must get home and tell his father. But at the bottom of the tree he stopped. He could no longer see the Iron Man against the twilight sky. Had he gone back over the cliff into the sea? Or was he coming down the hill, in the darkness under that high skyline, towards Hogarth and the farms? Then Hogarth understood what was happening. He could hear a strange tearing and creaking sound. The Iron Man was pulling up the barbed-wire fence that led down the hill. And soon Hogarth could see him, as he came nearer, tearing the wire from the fence posts, rolling it up like spaghetti and eating it. The Iron Man was eating the barbed fencing wire. But if he went along the fence, eating as he moved, he wouldn’t come anywhere near the trap, which was out in the middle of the field. He could spend the whole night wandering about the countryside along the fences, rolling up the wire and eating it, and never would any fence bring him near the trap. But Hogarth had an idea. In his pocket, among other things, he had a long nail and a knife. He took these out. Did he dare? His idea frightened him. In the silent dusk, he tapped the nail and the knife blade together. Clink, Clink, Clink! At the sound of the metal, the Iron Man’s hands became still. After a few seconds, he slowly turned his head and the headlamp eyes shone towards Hogarth. Again, Clink, Clink, Clink! Went the nail on the knife. Slowly, the Iron Man took three strides towards Hogarth, and again stopped. It was now quite dark. The headlamps shone red. Hogarth pressed close to the treetrunk. Between him and the Iron Man lay the wide lid of the trap. Clink, Clink, Clink! again he tapped the nail on the knife. And now the Iron Man was coming. Hogarth could feel the earth shaking under the weight of his footsteps. Was it too late to run? Hogarth stared at the Iron Man, looming, searching towards him for the taste of the metal that had made that inviting sound. Clink, Clink, Clink! went the nail on the knife. And CRASSSHHH! The Iron Man vanished. He was in the pit. The Iron Man had fallen into the pit. Hogarth went close. The earth was shaking as the Iron Man struggled underground. Hogarth peered over the torn edge of the great pit. Far below, two deep red headlamps glared up at him from the pitch blackness. He could hear the Iron Man’s insides grinding down there and it sounded like a big lorry grinding its gears on a steep hill. Hogarth set off. He ran, he ran, home – home with the great news. And as he passed the cottages on the way, and as he turned down the lane towards his father’s farm, he was shouting “The Iron Man’s in the trap!” and “We’ve caught the Iron Giant.” When the farmers saw the Iron Man wallowing in their deep pit, they sent up a great cheer. He glared up towards them, his eyes burned from red to purple, from purple to white, from white to fiery whirling black and red, and the cogs inside him ground and screeched, but he could not climb out of the steep-sided pit. Then under the lights of car headlamps, the farmers brought bulldozers and earth-pushers, and they began to push in on top of the struggling Iron Man all the earth they had dug when they first made the pit and that had been piled off to one side. The Iron Man roared again as the earth began to fall on him. But soon he roared no more. Soon the pit was full of earth. Soon the Iron Man was buried silent, packed down under all the soil, while the farmers piled the earth over him in a mound and in a hill. They went to and fro over the mound on their new tractors, which they’d bought since the Iron Man ate their old ones, and they packed the earth down hard. Then they all went home talking cheerfully. They were sure they had seen the last of the Iron Man. Only Hogarth felt suddenly sorry. He felt guilty. It was he, after all, who had lured the Iron man into the pit. 3 What’s to be Done With the Iron Man? So the Spring came round the following year, leaves unfurled from the buds, daffodils spread up from the soil, and everywhere the grass shook new green points. The round hill over the Iron Man was covered with new grass. Before the end of the summer, sheep were grazing on the fine grass on the lovely hillock. People who had never heard of the Iron Man saw the green hill as they drove past on their way to the sea, and they said: “What a lovely hill! What a perfect place for a picnic!” So people began to picnic on top of the hill. Soon, quite a path was worn up there, by people climbing to eat their sandwiches and take snaps of each other. One day, a father, a mother, a little boy and a little girl stopped their car and climbed the hill for a picnic. They had never heard of the Iron Man and they thought the hill had been there for ever. They spread a tablecloth on the grass. They set down the plate of sandwiches, a big pie, a roasted chicken, a bottle of milk, a bowl of tomatoes, a bagful of boiled eggs, a dish of butter and a loaf of bread, with cheese and salt and cups. The father got his stove going to boil some water for tea, and they all lay back on rugs munching food and waiting for the kettle to boil, under the blue sky. Suddenly the father said: “That’s funny!” “What is?” asked the mother. “I felt the ground shake,” the father said. “Here, right beneath us.” “Probably an earthquake in Japan,” said the mother. “An earthquake in Japan?” cried the little boy. “How could that be?” So the father began to explain how an earthquake in a far distant country, that shakes down buildings and empties lakes, sends a jolt right around the earth. People far away in other countries feel it as nothing more than a slight trembling of the ground. An earthquake that knocks a city flat in South America, might do no more than shake a picture off a wall in Poland. But as the father was talking, the mother gave a little gasp, then a yelp. “The chicken!” she cried. “The cheese! The tomatoes!” Everybody sat up. The tablecloth was sagging in the middle. As they watched the sag got deeper and all the food fell into it, dragging the tablecloth right down into the ground. The ground underneath was splitting and the tablecloth, as they watched, slowly folded and disappeared into the crack, and they were left staring at a jagged back crack in the ground. The crack grew, it widened, it lengthened, it ran between them. The mother and the girl were on one side and the father and the boy were on the other side. The little stove toppled into the growing crack with a clatter and the kettle disappeared. They could not believe their eyes. They stared at the widening crack. Then, as they watched, an enormous iron hand came up through the crack, groping around in the air, feeling over the grass on either side of the crack. It nearly touched the little boy, and he rolled over backwards. The mother screamed. “Run to the car,” – shouted the father. They all ran. They jumped into the car. They drove. They did not look back. So they did not see the great iron head, square like a bedroom, with red glaring headlamp eyes, and with the tablecloth, still with the chicken and the cheese, draped across the top of it, rising out of the top of the hillock, as the Iron Man freed himself from the pit. When the farmers realized that the Iron Man had freed himself they groaned. What could they do now? They decided to call the Army, who could pound him to bits with anti-tank guns. But Hogarth had another idea. At first, the farmers would not hear of it, least of all his own father. But at last they agreed. Yes, they would give Hogarth’s idea a trial. And if it failed, they would call in the Army. After spending a night and a day eating all the barbed wire for miles around, as well as hinges he tore off gates and the tin cans he found in ditches, and three new tractors and two cars and a lorry, the Iron Man was resting in a clump of elm trees. There he stood, leaning among the huge branches, almost hidden by the dense leaves, his eyes glowing a soft blue. The farmers came near, along a lane, in cars so that they could make a quick getaway in things went wrong. They stopped fifty yards from the clump of elm trees. He really was a monster. This was the first time most of them had had a good look at him. His chest was as big as a cattle truck. His arms were like cranes, and he was getting rusty, probably from eating all the old barbed wire. Now Hogarth walked up towards the Iron Man. “Hello,” he shouted, and stopped. “Hello, Mr Iron Man.” The Iron Man made no move. His eyes did not change. Then Hogarth picked up a rusty old horseshoe, and knocked it against a stone: Clonk, Clonk, Clonk! At once, the Iron Man’s eyes turned darker blue. Then purple. Then red. And finally, white, like a car headlamps. It was the only sign he gave of having heard. “Mr Iron Man,” shouted Hogarth. “We’ve got all the iron you want, all the food you want, and you can have it for nothing, if only you’ll stop eating up the farms.” The Iron Man stood up strait. Slowly he turned, till he was looking directly at Hogarth. “We’re sorry we trapped you and buried you,” shouted the little boy. “We promise we’ll not deceive you again. Follow us and you can have all the metal you want. Brass too. Aluminium too. And lots of old chrome. Follow us.” The Iron Man pushed aside the boughs and came into the lane. Hogarth joined the farmers. Slowly they drove back down the lane, and slowly, with all his cogs humming, the Iron Man stepped after them. They led through the villages. Half the people came out to stare, half ran to shut themselves inside bedrooms and kitchens. Nobody could believe their eyes when they saw the Iron Man marching behind the farmers. At last they came to the town, and there was a great scrap-metal yard. Everything was there, old cars by the hundred, old trucks, old railway engines, old stoves, old refrigirators, old springs, bedsteads, bicycles, girders, gates, pans – all the scrap iron of the region was piled up there, rusting away. “There,” cried Hogarth. “Eat all you can.” The Iron Man gazed, and his eyes turned red. He kneeled down in the yard, he stretched out on one elbow. He picked up a greasy black stove and chewed it like a toffee. There were delicious crumbs of chrome on it. He followed that with a doubledecker bedstead and the brass knobs made his eyes crackle with joy. Never before had the Iron Man eaten such delicacies. As he lay there, a big truck turned into the yard and unloaded a pile of rusty chain. The Iron Man lifted a handful and let it dangle into his mouth – better than any spaghetti. So there they left him. It was an Iron Man’s heaven. The farmers went back to their farms. Hogarth visited the Iron Man every few days. Now the Iron Man’s eyes were constantly a happy blue. He was no longer rusty. His body gleamed blue, like e new gun barrel. And he ate, ate, ate, ate – endlessly. The Iron Man returns to cause panic for the local farmers. The farmers are going to need a new plan to deal with the Iron Man. Something is coming to Earth.